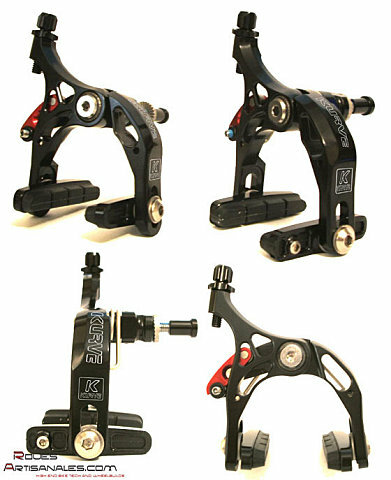 cam lever mechanism, modulates the caliper with equal force to both arms giving smooth yet controllable braking power, actually as a dual pivot caliper. They are available in CNC and polished black, with a very limited edition Gold anodised. Their price is £199.99. the envelope. Will it need a special hub body? Will the rear wheels be even more unbalanced than they are already with 10s? We will know more this year. Beside the carbon crank arms presented a few months ago, Shimano will have some other new stuffs for the second part of 2008. First, the electronic groupset should finally see the light in shops and should be available in quantity in 2009. Second, the Dura-Ace levers will have their derailleurs cables under the bar tape, a la Campagnolo.